Snoring and other sleeping disorders impact between 50 and 70 million Americans each year. However, did you know that our office can help when it comes to diagnosing and treating sleeping disorders? For this reason, we have put together this list to highlight how we can have a positive impact on your snoring. Many people are surprised to learn that physician training is lacking and very slowly evolving in the area of sleep related breathing disorders. Therefore, there is limited public and medical awareness. The American Academy of Sleep Medicine (AASM) has acknowledged that properly trained dentists are the first line of therapy for treating mild to moderate sleep apnea effectively. Because we see our patients on a more regular basis than many primary-care physicians, we dentists are in a unique position to identify and/or detect a SRBD. However, for us to accomplish this, you must share the facts about your sleeping habits and issues related to breathing. In other words, do not be embarrassed to let us know that your spouse, sleeping partner or family complain to you about your snoring! 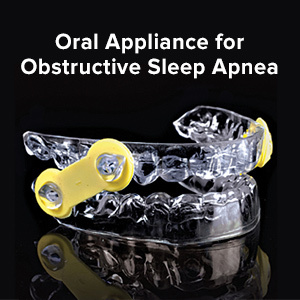 When it comes to treating complications associated with Oral Appliance Therapy (OAT) used in managing Sleep Related Breathing Disorders (SRBD), dentists are the primary professionals who are specifically trained to create, fit, adjust, monitor and treat any complications associated with a mouthpiece (oral appliance). Did you know that dentists help identify the approximately 90% of misdiagnosed cases of patients suffering from a SRBD? Well, it is true. We play a critical role in diagnosing and treating these patients. Another reason why it is much easier for us to diagnose and treat these problems is because the core of our training is centered upon the oral cavity, mouth and parts of the upper airway — the very areas where your snoring and SRBDs occur.